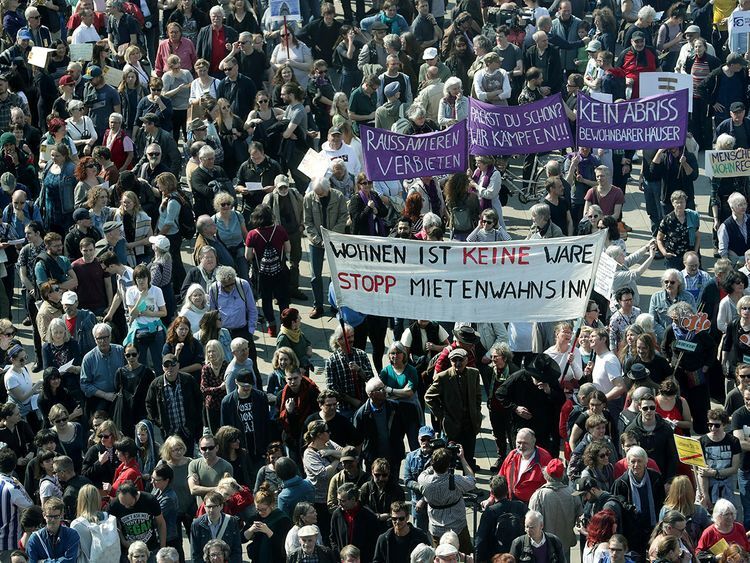 Berlin: Thousands of people on Saturday joined marches across major German cities against "rental insanity", or Mietwahnsinn, which has sparked a popular backlash. Organisers said at least 6,000 people gathered in Berlin's emblematic Alexanderplatz and were marching towards the working-class, predominantly immigrant district of Kreuzberg, which has been recently targeted by developers eager to make a fast buck. "No demolition of habitable houses," the protesters cried. Some of the marchers were disguised as what they called "real estate sharks". The protesters also launched a signature campaign to press for a local referendum for Berlin's city hall to expropriate properties of real estate companies possessing more than 3,000 apartments. They singled out companies such as Deutsche Wohnen and Vonovia, which have bought thousands of buildings in a capital with one of the cheapest real estate prices in Europe. They raze exiting structures to build luxury apartments and rented them out at higher rates. Many say this is a type of class struggle. Yes that's what it is. But we did not start it. We're taking defensive measures against the class struggler from the top who has for years been fighting against tenants. The wave of gentrification and rising rents is provoking outrage and leading some to ponder radical solutions like expropriating housing from institutional landlords. The campaign's spokesman Rouzbeh Taheri said the movement had radicalised as government measures to cool the property market have failed to work. "Many say this is a type of class struggle. Yes that's what it is. But we did not start it. We're taking defensive measures against the class struggler from the top who has for years been fighting against tenants." The "Expropriate Deutsche Wohnen & Co." initiative, named after the biggest private player in Berlin, targets companies with more than 3,000 apartments in their portfolios. "It's about sending a signal on which direction the city wants to go. And a signal to speculators - telling them that your capital is not safe in Berlin," said Taheri. Calling the initiative "completely absurd", Harald Simons, an economist at Leipzig University, noted that 70 percent of rental apartments across Germany are owned by small landlords who each hold between two and 20 apartments. Singling out the big groups would "mean that about five percent of Berlin tenants will suddenly not have to pay much while the rest would have to keep paying just as much," he said. Further, taxpayers would face a huge bill - Berlin authorities have estimated the cost at 36 billion euros ($40 billion). "When people learn about how many billions this will cost, many would see this differently," Berlin Mayor Michael Mueller said. Deutsche Wohnen boss Michael Zahn said the organisers of the initiative were taking a "very populist tone" and warned that the public was not being given the full picture. But Hans von Maydell was gearing up for battle, as the building he has lived in for 45 years changed ownership for the first time early this year. "The new owner ... buys and sells property with money from investors who want to make the highest profits possible," the 75-year-old said. In a pre-emptive move, he and fellow residents have sought protection under Berlin's "Milieuschutz" rules aimed at halting gentrification. Tenants have even formed a "rental rebel" choir to belt out their protest against rising rents. For von Maydell, a roof over one's head is as essential as drinking water and should not be "left to speculation and the free market". "We are in favour of these things coming under communal control and managed for the well-being of the community, and not for the well-being of the few who want to get rich quickly and ruthlessly."